When Is the Word “Love” First Used in the Bible? When is the first time the word love is used in the Bible? It is great fun to ask a million questions when you open the Bible. Good questions serve to unlock the treasure chest revealing untold riches. Since the Bible is a book and books are made of words, it is great fun to see how God uses words and where they are placed in the sacred text. Nothing is random or by chance with the words of God. If John 3:16 came to your mind, then you had the same reaction that I did. God loved His only begotten Son. These passages belong together — calling back-and-forth to each other for a reason. God gave us a human story of a father sacrificing his only son so we would understand His great sorrow when sacrificing His only Son whom He loved. The word love was saved for this crucial moment to describe the love of a father for his only son. 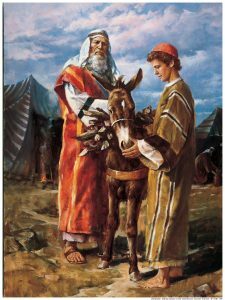 Abraham prefigures God the Father as he takes his son to Mount Moriah for the sacrifice. For the rest of this short article, click here.